Q. Did it feel like you were playing a player ranked 570 in the world out there today? RAFAEL NADAL: No. Even if that's the ranking when you are playing against a young player, you never have that feeling. He was able to win the first round against a tough opponent like Sijsling. That's not the real ranking on him. He played juniors, two finals on Grand Slams last year, so he has a great future. He has the right level to try to be in the tour very soon. So just keep working and that will happen. Q. Were you impressed by him, 17 years old? RAFAEL NADAL: Yes. There is now new generation that should come. Kokkinakis is one of these ones that can be there in the next couple of years. Is normal that new players are coming, new generations are arriving. That's happened in all the parts of the history of our sport.Strange for the last few years didn't happen, so that's something really normal that should happen and probably will happen and that's good for the game. Q. Did you prepare yourself to be on the court with the roof open in terms of physically getting yourself ready for the match, and would that have changed earlier if you had known you were going to be playing under the roof? RAFAEL NADAL: I prepare myself to play a tennis match, drinking the things that I have to drink before the match start and try to be ready for the really hard conditions out there. Then with the roof, the conditions are better, no doubt. Very happy to see the roof out there today. But still very humid. Still very hard conditions even with the roof on that match. But still hard. I felt that I was ready. Q. Pretty regulation game today. Are you happy with the amount of game time you've registered coming into the third round? RAFAEL NADAL: I think I played a great first set, not many mistakes, serving well, finishing the set playing aggressive with my forehand. I think I played really well first set. Then the second set I didn't play as good as I played the first. I stopped a little bit. I played with less intensity. Playing with less intensity equal more mistakes, and that's what happened.Was important that the serve was there during the whole match. And, in my opinion, the third set I finished the match playing well again, good forehands down the line. That's give me a lot last year, so is the way to keep improving.And is true that here that shot is a little bit more difficult because the court goes very quick when the ball bounce. When the ball bounce on the floor, is like goes very, very quick, so is very difficult to adjust with the balls.But I think I played at a very good level. The serve, that is a very important thing here, was working well. Q. With your opponent today, you identified a couple of his strengths. Would you see over three sets anything he could be working on to improve his game at this stage? RAFAEL NADAL: No. Always is the same thing, no? If you are able to keep improving in all aspects, then you will have the chance to be in the top position of the ranking and compete for the best tournaments.If you are not able to keep improving, your chances will be less. Because if you are not improving new things, the things that you have are going worst. That's my feeling.So always is the same thing when you are a young player. The main goal is keep improving in all aspects, no? But is true he has a great serve to be 17, so keep doing that.The normal thing is he will be serving better and better every year. Forehand, he has a good forehand. The normal thing is if he is able to improve with being humble, being with the right people around that don't make you feel you are a star before the right time.So he will have the chance to be a great player. That's my feeling. He has everything to do it. Q. Last year at this time what were you doing and how much did you follow the Australian Open? What times of the day did you follow it? 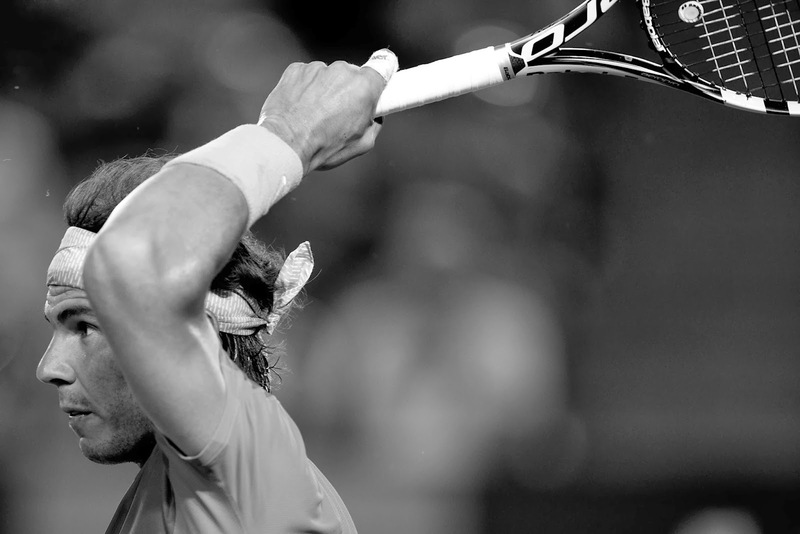 RAFAEL NADAL: Well, last year I was starting to practice. I remember that. I was in Barcelona practicing a little bit on clay. And was hard to see Australian Open, because in Spain only shows Australian Open Eurosport. I don't have Eurosport in my home (smiling), so was a tough situation to see.But anyway, I saw a little bit, a few matches. I was able to see that when I was in Barcelona. Was practicing the tennis in Barcelona and there they have the channel. I saw a little bit the match against Federer/Tsonga I think.Saw a little bit David Ferrer against Almagro and David against Djokovic, and I was not able to see the final. Q. Last Friday your opponent had the chance to do something that few of us in this room do. He asked you one question after another one on one at the Babolat event. You said he had a good future in tennis. Talk about his future in journalism. RAFAEL NADAL: My advice is keep working on tennis. Q. Can you remember the biggest match you had when you were a 17 year old? RAFAEL NADAL: 17? Oh, I played the fifth point of Davis Cup in Brno, Czech Republic, when I was 17. I played against Roger in Miami. I was on the tour, no? I think I won a tournament with 17, 2004.No, it was after. But I played against David Ferrer in Stuttgart. No, I think I played a lot of important matches with 17.But is true that when you have 16, I started at 17, you know, everything is to win. You go on court and you feel everything is new. If you lose in first round, you keep working. If you lose in quarterfinals, is a great result. If you lose in semifinals, fantastic tournament.Everything is to win. Mentally is easier to play when you are younger, but at the same time, important thing is have the chance to be the mental part very fresh, to analyze that you need to keep improving. Q. Despite the rankings difference, it's always going to be tough playing someone at their home Grand Slam. Did you feel the support for you out there? RAFAEL NADAL: I think is great. The atmosphere was always great. I played against Tomic in the past. I played two big matches against Lleyton. I lost one in five and another one in three. But was the first time I arrived here. That was with 17, I think, yeah. So was a big match.But I really enjoy a lot playing here. The crowd, even if you play against Australian, you feel that they respect every player. They know about tennis. They understand the sport. Is great.I never felt the crowd against me. I felt most of the times the crowd behind me, and that's something I just can say thank you very much to the Australian fans. Make me feel very, very, very happy and very special when I am there and I feel the crowd behind me.Another times that you feel the crowd share 50/50 is great atmosphere. Played long matches here that the crowd was fantastic. When the match became a little bit more dramatic, have the crowd involved in that kind of matches makes the matches more emotional.